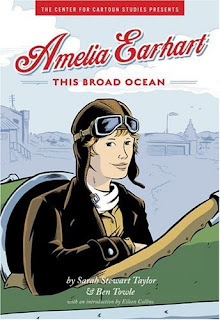 Another shout-out to Kate Dacey for sending me her copy of Amelia Earhart: This Broad Ocean. She wanted to make sure the book found a good home, and I hope that the book finds my humble abode suitable. Thanks again, Kate! The book is a partial biography of Amelia Earhart. Deliberately partial, I should note. Most of the story takes place during June 1928. Earhart was still early in her career as a pilot, and was racing to be the first woman to cross the Atlantic ocean by plane. She wouldn't be flying it herself, but she would certainly contribute more to the trip than her non-pilot competitors like Mabel Boll. The story is actually told through the eyes of budding reporter Grace "Nosy Nelly" Goodland. She's a young teenager from Trepassey, Newfoundland and takes a keen interest when Earhart, her pilot and her mechanic show up with the intention of using the harbor as launching point for their trans-Atlantic journey. The crew then spend the next couple of weeks repeatedly attempting to launch their flight, which is repeatedly thwarted due to weather and/or weight issues with the plane. With their extended stay, Goodland is able to find out a few things about Earhart and her pilot. As I'm sitting here writing this review, it only now occurs to me that not much actually happens in the book. Earhart's team hangs out in Trepassey for a couple weeks before taking off, all the while Goodland follows them (primarily Earhart) around. Even when Goodland lands an interview with Earhart and she expands on how she got interested in flying in general and with this flight in particular, there's not a lot to expound on. Which makes the book sound tediously dull. I think most Americans are at least aware of Earhart and her famous final flight. I can't recall how many comics, let alone stories in general, pick up on the "what happened to Amelia" plot thread. But I suspect considerably fewer people know of her life and accomplishments prior to that flight. Who Earhart was and, more importantly, what she meant to other women at the time. And that is one of the crucial elements to This Broad Ocean. It really isn't a biography about Amelia Earhart. It does indeed have biographic elements (including a detailed set of annotations in the back) but that's not really the point of the story. The book is more about women's role in Western society in the late 1920s and early 1930s. Who did young girls look up to as role models back then and why? In the days before the 24/7 media circus of famous-for-being-famous celebrities, what was it about certain women that put them in spotlight, and make others strive to reach the same types of achievements? There were progressive women like Susan B. Anthony and Elizabeth Cady Stanton who worked for equal women's rights from a political standpoint, it was women like Earhart who indirectly moved a more cultural agenda by providing an emotionally attractive and concrete set of aspirations through their examples. In 1928, there was no Wonder Woman. Or Lois Lane. Or Nancy Drew. Or Princess Leia. Or Lara Croft. Pop culture in America didn't yet have icons for women, and women like Earhart filled that void. This Broad Ocean really speaks to just how powerful and important she was. Certainly to the character of Goodland, but also to thousands of other women just like her. Writer Sarah Stewart Taylor and artist Ben Towle have crafted an understated, but still powerful tale that lets the reader see a little about who Amelia Earhart was but, more poignantly, what she meant. And still means.